For most players, their pool cue is their most important investment. As with any investment, if you treat it well, it will treat you well. Maintaining your pool cue is by far the best way to ensure a long life for your cue. Here at PoolDawg, we have some great products to help you keep your stick slick and cuesmith clean. When your pool cue starts to get dirty you will notice that the shaft doesn’t slide through your hand as effortlessly as it once did. This can be very distracting and will affect your play because you aren’t able to devote your entire focus on the shot. To quickly and easily fix a slightly dirty shaft on the fly, we suggest the Q-Wiz. 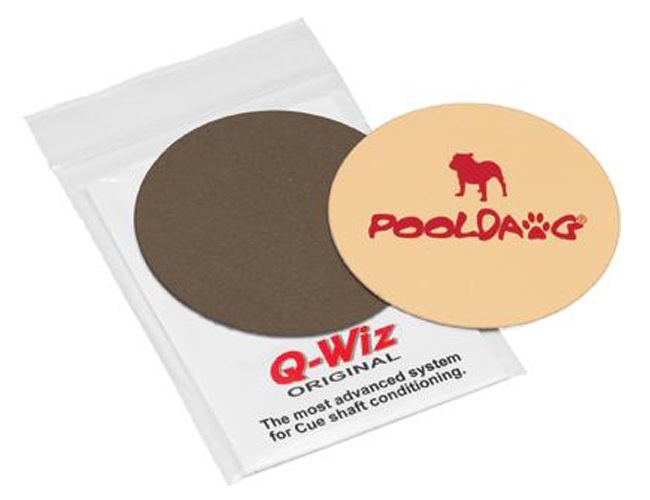 The Q-Wiz is a double-sided, micro pro disc featuring one side for cleaning and one side for polishing. Even though it feels slightly gritty, the Q-Wiz is as safe as rubbing a paper bag on your shaft. It has microfiber crystals that flex and bend to pluck out the dirt and oil that can accumulate in the pores of the wood. Starting with the cleaning side out (rougher) cup the Qwiz in your hand and with gentle pressure rub it up and down the shaft in long strokes. Do the same thing again using the polishing side (the side with the PoolDawg logo) and your shaft will be silky smooth allowing you to really concentrate on your shot. This is a MUST have product for every pool players case! Plus, it is washable so you can use it over and over again. After playing with the cue for a while, your shaft may require a deeper cleaning and for that we recommend using a liquid cleaner. We have several cleaning solutions that work great. 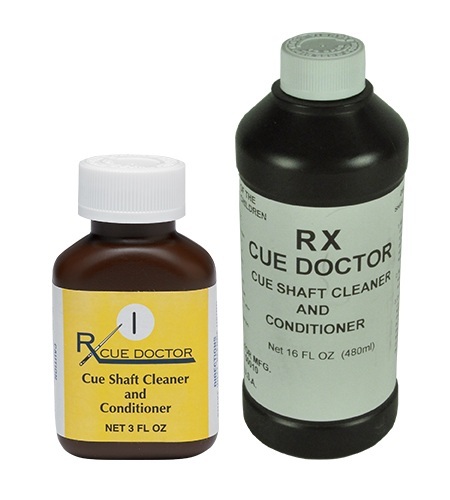 Our most popular cleaner is the Cue Doctor Shaft Cleaner and Conditioner that gently lifts out dirt and chalk residue while also nourishing the wood and leaving a nice soft sheen. This great product has a special formula that contains no harsh chemicals such alcohol or acetone that could dry out and damage the wood. The Q Clean is another highly effective cleaner which is actually a powder that you can rub on with a damp towel. This product does use some bleach so you would want to use it sparingly. If you have a fiberglass coated or graphite shaft then you MUST use the Cuetec Hi-Tech Shaft Cleaner as it contains no abrasive particles that could scratch the special surface coating and it does work well on all maple shafts too. 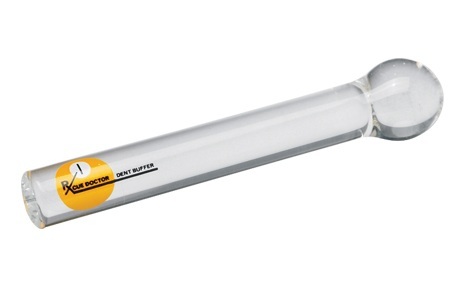 Right after you get done cleaning your shaft or when you first receive a new shaft it is a great idea to apply some shaft conditioner before you start to play with it. The conditioner (we recommend the Q Glide) will seep into the pores of the wood and, in addition to treating the wood, it will also help to prevent some of the dirt, oils and chalk from sticking to your cue keeping it clean and slick longer. To apply the conditioner, just run a bead of the solution down the length of the shaft, rub it in evenly with a thin rag or paper towel and let it sit for 10-15 minutes before wiping it down again with a clean towel. Your shaft will keep the slick feel for several weeks of play. Cue Wax, like the Cue Doctor Wax, will also keep your shaft slick and shinny, sealing off the pores and protecting the wood. This is best applied with a cue lathe so that the heat from the friction allows the wax to liquefy and become one with the wood but a good amount of elbow grease (rubbing really hard) will also get the job done. Every cue can acquire annoying nicks and dents in the shaft that can affect total concentration. That's why we carry the Cue Doctor Dent Buffer. This tool is simple, convenient and effective for removing those dents, without damaging the wood with steam or alcohol. It is made of hardened borosilicate glass to assure the utmost in quality and consistency. And a dab of moisture to the dent and simply rub the glass rod over the dent in the shaft lightly and vigorously with 12 inch strokes until the clicking sound of the dent fades away as the dent is smoothed. This product can also be used to shine your worn Irish linen wraps or smooth out frays and scratches. It has repeatedly received high ratings and rave reviews, and is well worth every player's consideration. We've got dozens of shaft tools and shaft products to choose from. Check out our entire selection of shaft tools or give us a call at 866-843-3294 and we'll be happy to help you find the best shaft tools for your cue.